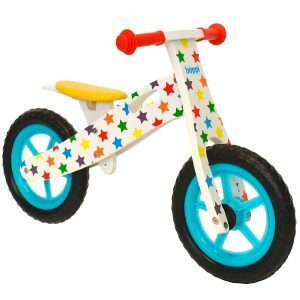 If you're looking for a wooden balance bike you may have come accross the Bopster/Boppi Children's Wooden Balance Bike. This bike is a budget bike. It does has a lots of good features but may not suit every child. So should you purchase? Find an anaylsis of the Boppi's features to help you make a decision. The seat height has two seat heights 36cm and 39 cm which is approximately just under 14 inches to just over 15 inches. Bear in mind that the seat height on a balance bike should be adjusted to be approximately 1 inch or 2.5cm less than your child's inseam (the measurement from the top of the crotch to the floor). The best way to find out if it's the right size for your child is to measure their inseam and make sure that the balance bike can be adjusted to about 2.5cm less than that. It is important the kids can push their feet along the floor to propel the bike along. If their feet aren't able to go flat on the ground when sitting on the bike It's difficult for them to make the bike move. Find out how to measure a child's inside leg / inseam. As kids get older you can adjust the seat from 36cm to 39cm so the balance bike can grow as kids grow too. The seat is also padded to add some extra comfort. One thing this bike does have going for it, is that it's really lightweight at 2.4kg. A lightweight bike is great when it's the parents who are carrying the bike when their little one gets tired. It's also great for younger and lighter kids to be able to control and handle. Generally smaller and lighter kids will find heavier bikes harder to use and control so this is a great plus. An excellent and very practical feature of the bike is the cut handle in the frame which makes it easy for adults to carry when kids have had enough. The tyres are made out of EVA foam which is standard on a lots of balance bikes. EVA foam is great in the fact that it can't get punctured so you don't have to worry about maintenance of the tyres. Air filled tyres do provide more traction and are great for going off road and for heavier riders. However, when riding along pavements and paths and for younger kids, EVA foam tyres should be just fine. The bike features soft handlebar grips for added comfort. Another plus wooden bikes have over metal ones and that also applies to the Boppi bike is that they are much more environmentally friendly. The bike is made from ECO friendly birch plywood. I can't find mention as to whether this comes from a sustainable wood source but it's definitely more eco friendly in comparison to metal balance bikes. EVA tyres are not so good for off road or dirt tracks. The is a budget balance bike with some good features. It's lightweight so it makes it easy for younger, smaller children to use and for parents to carry. If you're looking for a cheap wooden balance bike which is lightweight this is a good choice. If you need a wooden balance bike with a lower seat height or have a bigger budget, check out some more options on the best wooden balance bikes page. For children with an inseam of around 38.5cm. They will get the most out of this bike. They will be able to use it straight away and have some growing room too. Sharing with siblings - you can adjust the seat height on the bike but it's not easily adjustable without tools. Some balance bike have no tool adjustments which means you can very quickly and easily adjust the seat in between children using it. Kids with an inseam of 41.5cm or more will grow out of it extremely quickly. Look for a balance bike with a higher seat range.